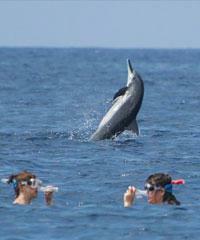 Swimming with Dolphins in Hawaii! 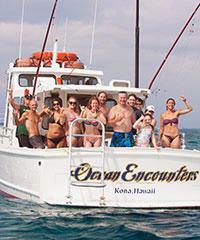 Hawaii dolphin watching together with swimming with the dolphins in Hawaii is an industry all to its own. 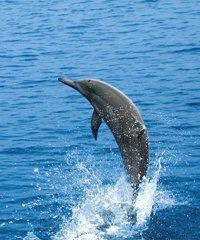 There is probably no sea creature quite as endearing in the eyes of a human being as the dolphin. 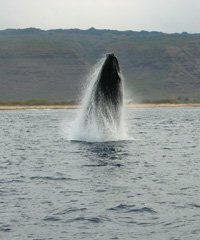 Watching the whales off the coasts of Hawaii is popular as well but this only occurs during the winter months, while man's infatuation with the dolphin populations can endure the entire year long. 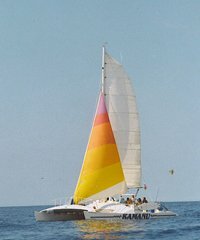 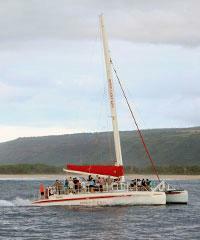 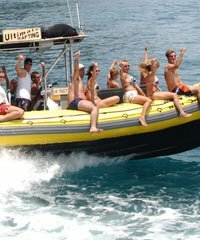 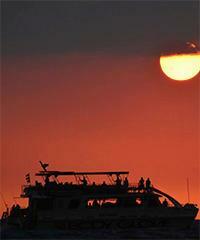 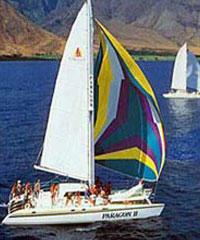 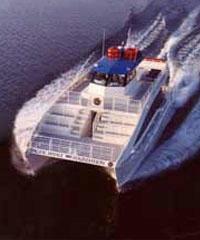 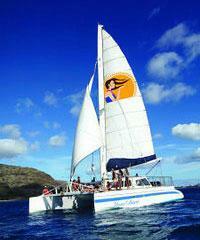 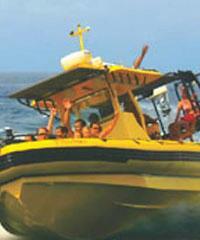 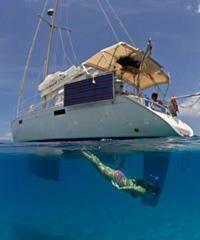 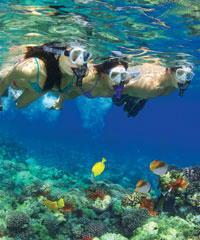 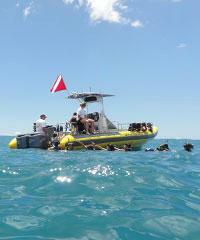 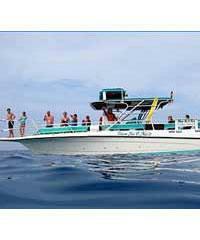 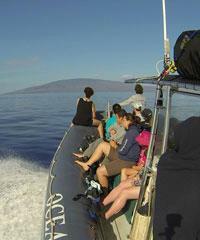 Dolphin Watching is co-mingled with other categories of activities. 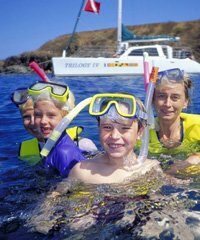 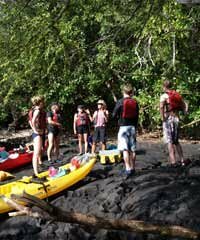 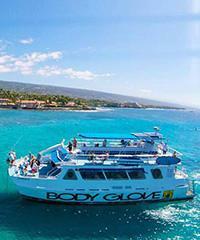 Hawaii Dolphin watches don't appear simply as their own category of activity but are intermingled with other ocean based activities like Snorkeling, Dinner Cruises and Sunset Sails, Whale Watching and Diving Tours of all types. 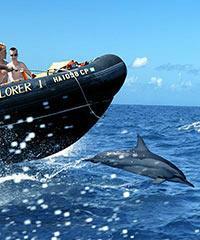 It seems that any excuse we can find to come in contact with a dolphin is one we will take if it is at all possible. 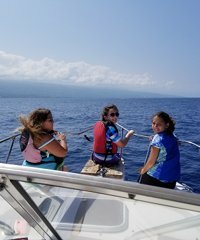 Luckily the relationship that has evolved over the years between the companies in Hawaii that take clients out to visit with the Hawaii dolphin populations and the Hawaii dolphins themselves has been a good one. 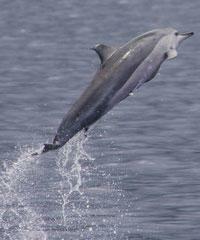 Dolphins are observed but not chased. 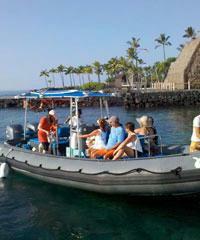 If they choose to come play with the Dolphin Watching boats or the people on them it is their choice alone. 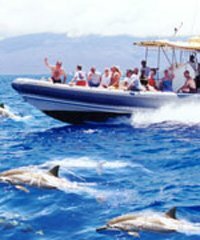 The ultimate in respect has been shown to the dolphin populations particularly regarding swimming with the dolphins in Hawaii and as a result the majority of Dolphin Watching tours that set out to find them do so. 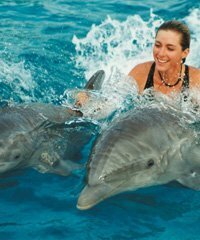 In some places on some islands the dolphins allow people to swim with them and by all appearances it really seems that they enjoy doing so. 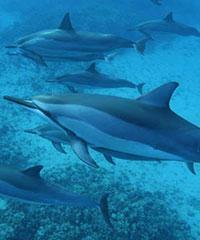 The relationship between the dolphins and the Hawaiian visitors that flock to see them could in some ways be considered symbiotic. 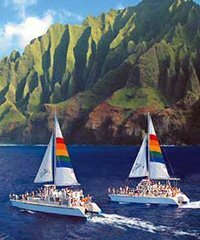 We enjoy the dolphins and we protect them from harm, at least from other humans and for all intents and purposes it appears that the Hawaii dolphin populations are thriving!. 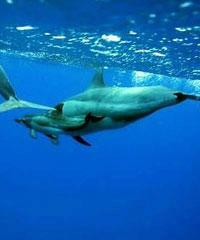 Swimming with Dolphins in Hawaii involves two different types of Dolphins. 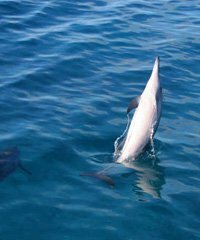 The dolphins that we primarily see on the dolphin watching tours of Hawaii are the Spinner Dolphins and the Bottle Nose Dolphins. 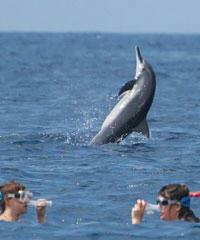 Of the two the Spinner Dolphins are the most prevalent and in many respects, the most fun as well. 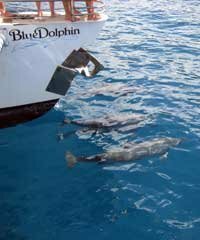 Occasionally you will see dolphins in groups of four of five but it is much more likely that when you see a dolphin you will see scores of them. 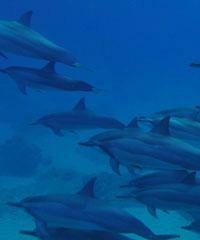 Dolphins enjoy staying together and swimming and hunting in pods and even sleep within range of their pod as well. 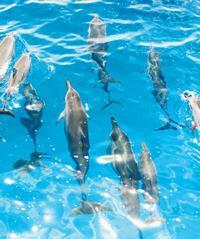 Dolphins are social animals much like we are and perhaps that is part of their appeal to us. 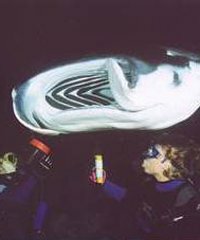 The one manifestation regarding their personalities that we could take a big lesson from is their sense of play and predilection toward comedic performance. 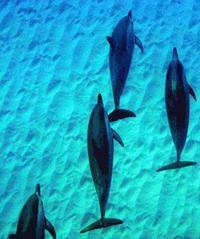 If we could only learn to be as happy as the dolphins there is no question the world would be a better place. 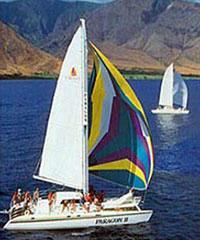 Dolphins Can Be Found On All the Hawaiian Islands. 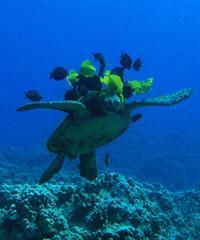 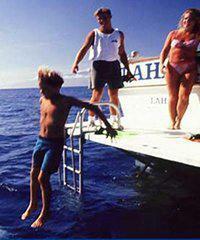 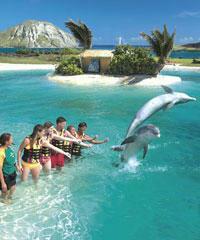 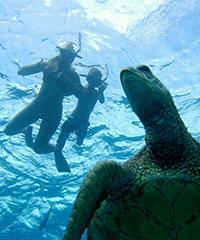 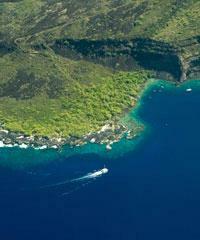 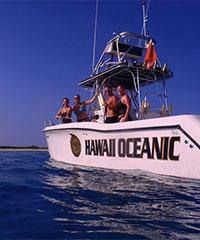 The two best islands for Swimming with the Dolphin in Hawaii are on Oahu and the Big Island. 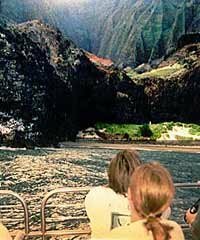 All the islands of Hawaii are home to dolphins but some islands provide a better vantage point from which to watch them and to enjoy them. 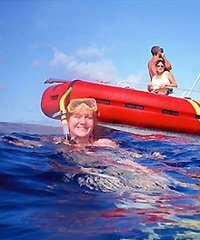 The two best islands to swim with the dolphins would undoubtedly be an Oahu dolphin swim along the Waianae Coast and another tour off the Kona Coast of the Big Island. 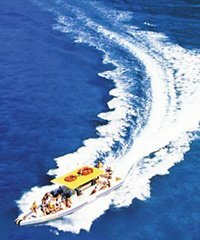 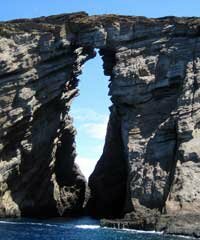 These are spots that the dolphins frequent on an almost daily basis and the wonderful boat tours and wise boat captains that take visitors into these areas to visit the dolphins are the very tops in their profession. 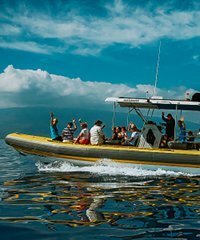 Every effort is made to make the dolphins feel comfortable with the people on the boats and no aggressive human behaviors are allowed. 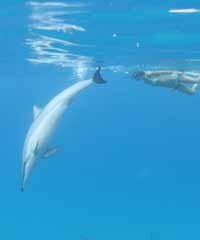 The dolphins are basically quite curious and will generally come close for a good look at the clumsy human swimmers but often just as quickly as they appear they will disappear into their own dolphin world. 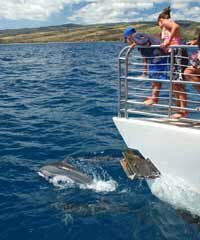 The island of Maui is known for its dolphins which are generally found either off the coast of Lanai or off the southern Kanaio Coast of the island. 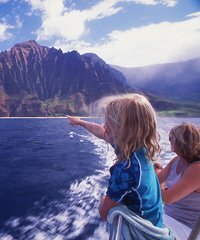 Dolphins here will also come for a good look at their human counterparts but it is much less likely that you will be able to go swimming with the dolphins in Hawaii here. 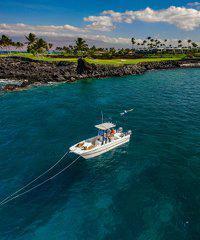 Dolphins here will also come for a good look at their human counterparts but it is much less likely that you will be able to go swimming with the dolphins in Hawaii here. 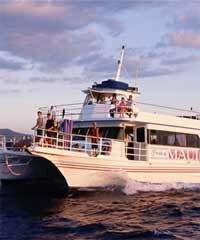 In fact, none of the dolphin watch tours on Maui will even indicate that it is a likely possibility but there is of course a high probability that you will be able to observe them from your vessel. 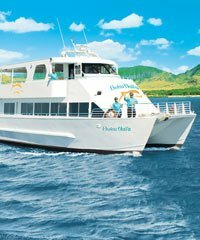 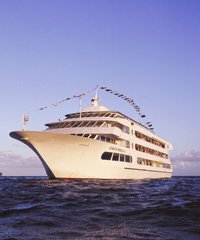 Some of these vessels provide educators on board that are considered well versed in Hawaii dolphin behavior and they will explain much about the daily life of the dolphins before, during and after they are sighted. 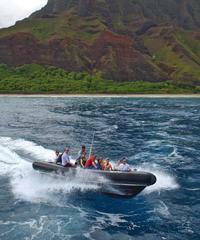 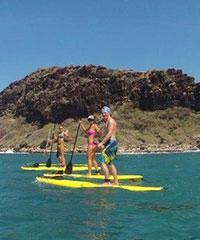 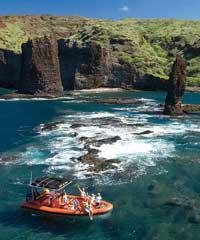 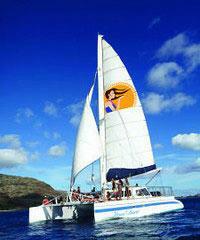 Perhaps the most fun island from which to experience dolphins is the Island of Kauai. 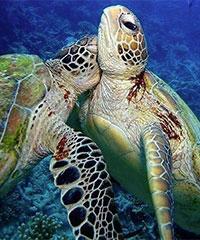 It is so rare to go out into the waters here and not see them. 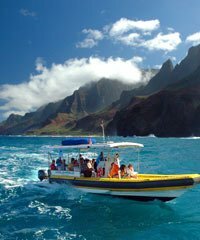 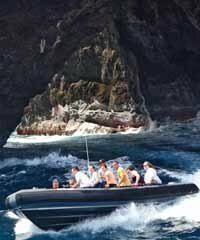 As if the tours on Kauai which visit the beautiful cliffs of the Na Pali Coastline were not exciting enough, the dolphins that also join you on these journeys make the day trip all that more enjoyable. 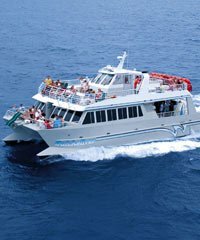 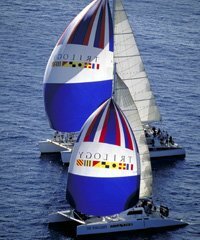 Dolphins will frequently race the boat you are on as they swim head to head with the bow of the boats and the best views are on the double-hulled catamarans that allow the full expanse of area between the two hulls to be a race track for the playful dolphins.